The road trip continues for the Belfast Giants with back to back games in Sheffield and the first battle of the season between two sides whose animosity was all too apparent last term. 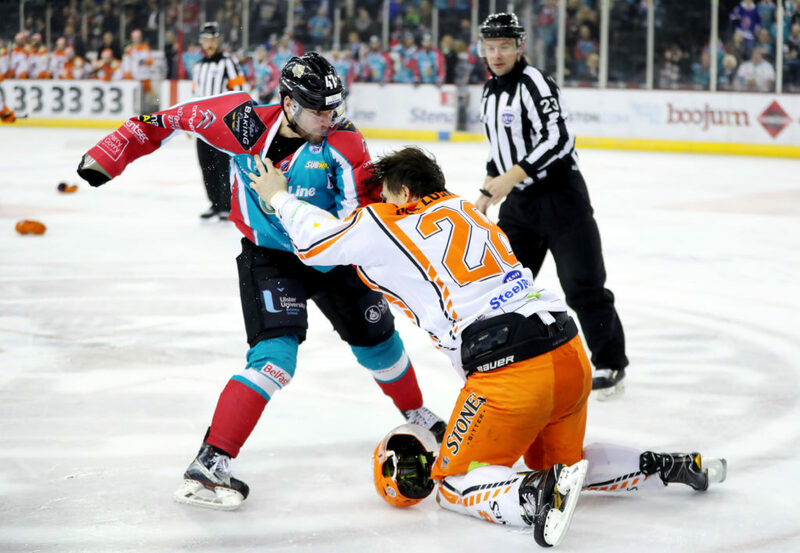 The “Fretter-Goulakos Affair” clouded every meeting of the teams for the remainder of that season and fuelled what became a heated rivalry both on the ice and in social media, with the usual suspects (suspect?) in South Yorkshire finding an odd “Trumpian” need to obfuscate the facts and press the propaganda ridden line. Yet this season for the Steelers has been a lot different, and a lot more turbulent. A mass clear out of the dressing room imports over the summer was followed by a number of new faces. Not least those of Former Belfast Giants Jackson Whistle and Ryan Martinelli. Sheffield has never been the most stable of clubs for sustained employment, they have been known over the years to have a short fuse when it comes to moving players or even coaches on quickly should performances in the here-and-now not be to the levels they deem sufficient. And so it transpired, from the sacking of the Rupert Brothers to the resignation of Paul Thompson the Steelers attempted to overturn their horrendous early season form that witnessed them lie bottom of the pile in Elite League. Former Vezina trophy winner Tom Barasso stepped in and continued to ring the changes, not least bringing Matt Clime in goal to replace, or least “challenge” a severely underperforming Jackson Whistle. And so the Giants arrive in Sheffield tomorrow facing an altogether different Steelers team to that which existed a little over 8 weeks ago. 6th in the standings and 4 consecutive wins at their back, you could consider them “resurgent”, yet they face a Belfast Giants team who were undefeated domestically through the month of November, sit top of the EIHL on the back of 10 consecutive league and cup wins, and a mid week 8-0 thrashing of the Dundee Stars on Tayside. While the Giants should enter the Fly-DSA Arena with the utmost confidence, they should not let complacency dog their performance. Barasso’s style of game is winning out in this Sheffield side. The return of Eric Neiley from MK gives their current 4th line (until he apparently “gets fit”?) significant depth, and the forwards are starting to find the goals with more regularity than was visible a few months ago. In a weekend that two prize fighting heavyweights go to war at the Staples Centre in Los Angeles, two of the EIHL’s own heavyweights resume hostilities on the ice, yet another test of character for Adam Keefe’s Road Warriors, and a test of resurgence for Tom Barasso’s men. With a few hundred travelling Giants fans expected to be making the trip, it certainly has the potential to be one interesting weekend. Podcast: Fight Fire With Fire!